April 2011 Update to Preferred Stock Investing Now Available! Readers of Preferred Stock Investing, Third Edition, are entitled to free periodic updates to the preferred stock tables presented throughout chapter 15 of the book as long as the Third Edition is in print. Providing free periodic updates helps keep readers of Preferred Stock Investing up to date. 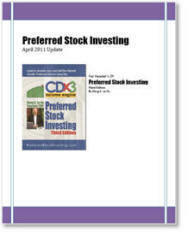 The April 2011 update to Preferred Stock Investing is now available! Preferred Stock Investing, Third Edition is one of the most highly reader-rated books of any kind available for sale in the United States (Amazon 4 stars). To receive the free April 2011 update to Preferred Stock Investing, Third Edition just follow the instructions on the first page of chapter 15 in the book. If you have yet to pick up your copy of Preferred Stock Investing, Third Edition you can do so at any of your favorite online retailers (see retailers | see reader reviews). Please pick up your copy today then follow the instructions on the first page of chapter 15 to download the free April 2011 update. And by the way: the all new Version 4 of the CDx3 Notification Service website was turned on during April - take a tour. Thanks to a very unique sequence of events market conditions have not favored calls since 2003 so investors are treating callable preferred stocks no differently than issues that are not yet callable. Almost every high quality preferred stock issued since 2003 is still trading, increasing the number of choices available to preferred stock buyers. 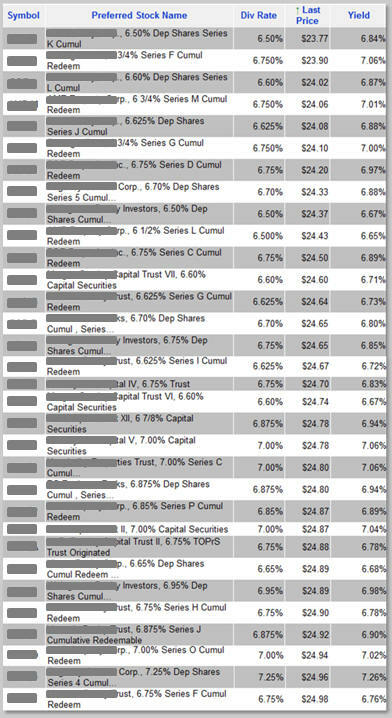 The lack of call conditions has provided preferred stock buyers with this list of 32 high quality preferred stocks available right now for less than $25 per share (note that in order to protect the value of subscriptions to the CDx3 Notification Service, my preferred stock email alert and research newsletter service, trading symbols are not provided here. But this is real data gathered on April 29). All of these preferred stocks are issued by companies that have never suspended a preferred stock dividend, are rated investment grade and have the 'cumulative' dividend provision (meaning that in the unlikely event that the issuing company skips a dividend payment to you, they still owe you the money; their obligation to you accumulates). Preferred stocks become callable by the issuing company five years after they are introduced. Conditions will favor calls when today's "going dividend rate" is lower than preferred stock dividend rates from five years ago. That would allow the issuing company to issue a new preferred stock at today's lower rate and use the proceeds to call (buy back from you at $25 per share) the older more expensive issue. They "refinance." But take a look at the interesting sequence of events that has unfolded over the last several years. These events have produced an dramatic increase in the choices available to preferred stock buyers. The high quality preferred stocks that were issued during 2001 became callable five years later in 2006. Looking at this chart, you can see that the average dividend rate in 2006 was much less than the 2001 rate so almost all of the high quality preferreds issued during 2001 were called during 2006. Same for 2002 issues; dividend rates in 2007 were low enough to trigger calls for 17 of the 27 high quality preferred stocks issued during 2002. But that’s where it ended. 2003 and 2004 issues became callable in 2008 and 2009, respectively, right in the teeth of the Global Credit Crisis when dividend rates hit record highs. No calls there. 2005 issues, with an average dividend rate of about 6.9% became callable in 2010, but, looking at the chart, rates came back down in 2010 to 6.8%. Issuing a new preferred stock at 6.8% in order to retire an older issue costing the issuing company 6.9% did not generate enough savings to trigger calls of the 2005 preferred stocks. Because of this unique multi-year sequence of events, almost every high quality preferred stock issued since 2003 remains available. For that to change, today's "going dividend rate" of 6.9% has to fall before we start seeing more calls. But, with the federal funds rate currently at zero, nobody is talking about interest rates going any lower. So preferred stock buyers should continue to have an inflated inventory to pick from such as this list of 32 high quality issues selling for less than $25 per share. Subscriber's to the CDx3 Notification Service (my preferred stock email alert and research newsletter service) were provided with this same list, including the trading symbols, on page 4 of this month's issue of the subscribers' newsletter, CDx3 Research Notes. Please consider becoming a subscriber to the CDx3 Notification Service today (take a tour of the all new Version 4 subscriber's website, implemented during April 2011). (Already a subscriber? For symbols, check out page 4 of the current issue of the subscriber's newsletter, CDx3 Research Notes). The Big Bank Trust Preferred Stock (TRUPS) opportunity first reported to you here in July 2010 is starting to come to fruition as our Big Banks are starting to turn their unofficial statements into official announcements to shareholders. Triggered by the 2010 Wall Street Reform Act, there are actually three opportunities here for preferred stock investors. And it is not too late to participate as the seven Big Bank TRUPS listed in this table illustrate (note that in order to protect the value of subscriptions to the CDx3 Notification Service, my preferred stock email alert and research newsletter service, trading symbols are not provided here. But this is real data gathered on April 29). If you are unaware of the Big Bank TRUPS opportunity created by the 2010 Wall Street Reform Act please read this article from the July 2010 issue of the CDx3 Newsletter for the whole story. The short version is that the Act changes the formula of a key measurement of bank reserves called Tier 1 Capital, effective January 1, 2013. Starting on that day, Big Banks (assets greater than $15 billion) will no longer be able to count TRUPS that they have issued toward this key metric of reserves. Since boosting that reserve calculation was the primary reason that these Big Banks issued these TRUPS to begin with, the Act makes it extremely likely that these Big Banks will retire (buy back from shareholders) these TRUPS as their call dates arrive, beginning January 1, 2013. In that event, shareholders will receive $25.00 per share from the issuing bank. During April we received the first public confirmation that the Big Bank TRUPS opportunity first described in our July 2010 newsletters (this free CDx3 Newsletter and the subscriber's newsletter, CDx3 Research Notes) is starting to come to fruition. On April 21, 2011 BB&T Corporation, our ninth largest bank, announced that, to comply with the 2010 Wall Street Reform Act, it will be calling its $3.2 billion worth of trust preferred stocks as their call dates start to arrive in 2013. The announcement (summarized in this Bloomberg article) makes BB&T the first Big Bank to deliver on the Big Bank TRUPS opportunity created by the Act. BB&T will be paying shareholders of their TRUPS $25.00 per share as the call dates for these securities arrive, beginning in 2013 (dividends will continue to be paid every quarter until then). 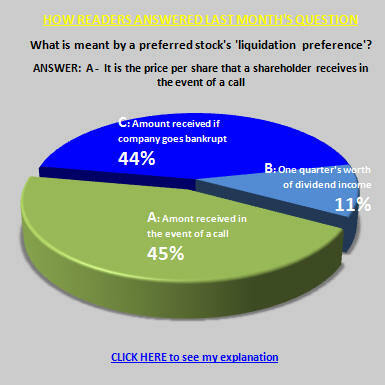 The preferred stock investing method described throughout my book, Preferred Stock Investing, shows how preferred stock investors are able to purchase preferred stock shares for less than $25.00 per share. If you own shares of BB&T trust preferred stocks and paid less than $25.00 for them, congratulations! As their call dates arrive, you are going to be piling a nice capital gain on top of the great dividend income that these securities provide. If you paid more than $25 for your shares, it is time to start paying attention to the market price. Be very careful here. The Rule of Call Date Gravity (Preferred Stock Investing, page 59) states that if market conditions favor a call, the market price of a CDx3 Preferred Stock will tend toward $25.00 per share as the call date approaches. You do not want to get caught flatfooted and end up taking a capital loss that offsets the dividend income that you've been earning. 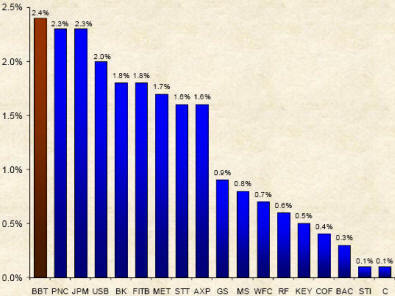 Pay particular attention to the market price of these securities in the days following each quarterly ex-dividend date. Per the Rule of Buyer/Seller Behavior (Preferred Stock Investing, page 43), the market price will tend to be lowest for the quarter at that point in time. You might want to set up an alert in your online brokerage account that sends you an automatic email message if the market price approaches your purchase price. Preferred Stock Investing makes this point over and over but it bears repeating here - to enjoy the benefits of additional principal protection and a potential downstream capital gain, avoid paying more than $25 per share for your CDx3 Preferred Stocks. (Already a subscriber? For symbols see page 7 of the May 2011 issue of the subscriber's newsletter, CDx3 Research Notes). BB&T Corporation is a $19 billion regional bank holding company. Branch Banking and Trust traces its history to 1872. BB&T is headquartered in Winston-Salem, North Carolina. A series of key acquisitions over the past several years has left BB&T the nation's ninth largest bank. BB&T is also showcased in the Special Announcement article above. One of BB&T's most memorable moments in recent history was provided by long-time (but now former) CEO John Allison in September 2008 just as the Treasury's TARP program was taking shape. BB&T was one of the Big Banks that was required to volunteer for TARP funds by Treasury as a cover for Citi (among others). Blistering hot at this intervention, Allison wrote a now famous letter to Congress explaining exactly what he thought of the circumstances. BB&T took the TARP money as required then repaid it a few months later. You can read Allison's letter here. BB&T was established in post-Civil War North Carolina by private investors to help rebuild the farms and small business in the area. Co-founder Alpheus Branch joined with Thomas Jefferson Hadley, who was trying to put together financing for public schools at the time, to form the Branch and Hadley bank. The first 'B' in BB&T still refers to its original founder. Recent acquisitions include Fidelity Federal Bankshares and Virginia First Financial (1997); Maryland Federal Bancorp and Franklin Bancorporation (1998); Mainstreet Financial First Citizens, Mason-Dixon Bancshares, Matewan Bancshares and First Liberty (1999); Premier Bancshares, Hardwick Holding Company, First Banking Company of Southeast Georgia, One Valley Bancorp and BankFirst Corp. (2000); FCNB Corp., FirstSpartan Financial, Century South Banks, Virginia Capital Bancshares, F&M National Corp. and Community First Banking Company (2001); MidAmerica Bancorp, Area Bancshares and Regional Financial Corporation (2002); Equitable Bank and First Virginia Banks (2003); Republic Bancshares (2004); Main Street Banks and First Citizens Bancorp of Cleveland, Tennessee (2006); Coastal Financial (2007); Haven Trust Bank of Atlanta (2008) and Colonial Bank of Montgomery (2009). Learn more about BB&T Corporation: Company website | Profile | Upgrades/Downgrades | Recent News. What is a Trust Preferred Stock (TRUPS)? There are three types of preferred stock - traditional preferred stock, trust preferred stock and third-party trust preferred stock. Other terms that you may hear (such as "cumulative preferred stock" or "convertible preferred stock") refer to characteristics of the preferred stock or its dividends, not the type. A cumulative preferred stock is a traditional, trust or third-party trust preferred stock whose dividends are cumulative; a convertible preferred stock is a traditional, trust or third-party trust preferred stock whose shares are convertible to the company's common stock at some point in time or under certain conditions. But there are only three types of preferred stock. From the investor’s perspective, there is very little difference. The difference exists to accommodate various reporting needs of the issuing company. The question this month for preferred stock investors: What is a trust preferred stock? (A) A type of preferred stock that allows the issuing company to treat the dividend expense as a tax deduction. (B) A type of preferred stock originally created by Goldman Sachs to allow Enron to shelter income offshore. (C) A type of preferred stock that the 2010 Wall Street Reform Act removes from the calculation of bank reserves. Enron made trust preferred stock (TRUPS) famous by taking advantage of a loophole (closed in 2003). Since then, for reasons that I will explain in a moment, only banks issue TRUPS but that is coming to an end as well. When a company issues a trust preferred stock (TRUPS), they first set up a new company (the trust). That trust sells the TRUPS shares to the investing public and loans the proceeds back to the issuing (parent) company. The issuing company, in exchange for this loan from the trust, issues a bond (usually a “junior subordinated debenture”) to the trust, which is a promise to pay back the loan plus interest. As the issuing company makes interest payments to the trust, the trust uses that cash to pay dividends to the investors who purchased the TRUPS shares from the trust. The trust is essentially a middleman, collecting cash interest payments from the issuing company and passing that cash on to investors in the form of dividend payments. The IRS collects taxes from the trust on the interest income that the trust received from the issuing company...unless the issuing company locates the trust offshore beyond the reach of the IRS in, say, the Turks & Caicos (which Goldman Sachs, at the time, set up for Enron). Bingo, no taxes. Also, reporting the TRUPS as “equity” on the company’s books, along with other common and preferred stocks, lowers the company’s all important “debt-to-equity” ratio, making the company’s SEC filings look more attractive to investors. And for banks, the value of the TRUPS, right along with the value of the bank's traditional preferred stock, was allowed to be counted toward the bank's reserves watched by regulators (Tier 1 Capital). So TRUPS’s provided a double benefit to their issuing companies – lower taxes plus stronger SEC filings. Plus, for banks, the third benefit of boosting their regulatory reserves. New accounting rules in 2003, however, required the issuing company to pay taxes on the interest payments sent to the trust and the TRUPS shares issued by the trust are now required to be reported as a liability on the parent company’s books rather than as equity. More recently, the 2010 Wall Street Reform Act goes a step further and disallows the counting of TRUPS as Tier 1 Capital which should effectively eliminate the issuance of new TRUPS by banks. There are currently 1,077 preferred stocks trading on U.S. stock exchanges with 36 new issues introduced so far this year. There are usually 1,000 to 2,000 preferreds trading, depending on the rate of new issues, calls and maturities, so 1,077 is actually on the low side. We have seen new issues from a variety of industry segments, from Goodyear Tire & Rubber Company to technology firm Unisys Corporation. Seaspan Corp., a very interesting shipping company that's actually not in the shipping business, even got into the act with a new offering. This outfit desperately needs to diversity its customer base beyond China before it will attract an investment grade rating however. In terms of high quality issues Real Estate Investment Trusts (REITs) have led the way so far this year but look for that to change. Some pretty good information is saying that banks are going to be introducing new high quality traditional preferred stocks, starting with regional banks as soon as next month. As banks get clear of their TARP obligations, attentions have turned toward raising Basel III-compliant capital and that points directly to either more bonds or new traditional preferred stock issues. According to an analysis by Zack's posted to the CDx3 Reading List on the CDx3 Notification Service website, we will see a new regional bank-issued preferred stock within the next few weeks. And it appears that this new issue will meet all ten of the CDx3 Selection Criteria from chapter 7 of Preferred Stock Investing. 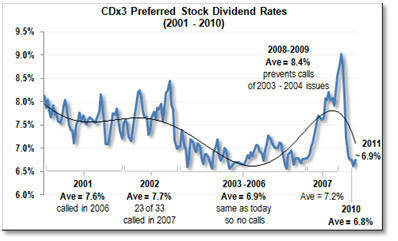 Dividend yields for the highest quality CDx3-compliant preferred stocks are running right around 7%. These are preferred stocks issued by companies that have never missed a preferred stock dividend payment, have investment grade ratings and carry the "cumulative" dividend requirement (if the issuing company misses a dividend payment to you they still owe you the money; their obligation to pay you accumulates). Beyond the usual activity from REITS and others, preferred stock investors should look for new high quality preferred stocks issued by regional banks.